Having to suffer with headache pain is the worst. I used to suffer from frequent headaches and migraines until I decided I didn't want to suffer from the pain anymore. Through my own personal research and experimenting I was able to get rid of my headaches, and I was able to do it in a short amount of time. 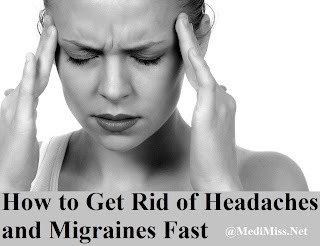 I would like to share with you what I found so that you can also get rid of headaches fast. Throughout my teenage years and early 20's, I dealt with weekly headaches and migraines. The pain was debilitating. There was so much pain in my head and brain that it made it nearly impossible to concentrate or do anything productive. I like to heal any health challenges I encounter naturally. So I researched and experimented with foods that I could eat that would help to prevent headaches. I would like to share with you the foods I found that I could eat to help get rid of headaches fast. I also found out foods to avoid that can trigger headaches. I will share a few of those as well. Here's to a new you... headache free! Before I get into the foods, it's important to talk a little bit about headaches. So what is a headache? A headache is pain anywhere in the region of the head. The pain is caused by disturbance of the pain-sensitive structures around the brain. According to the National Institute of Health, there are four types of headaches: vascular, muscle contraction (tension), traction, and inflammatory. The most common type of vascular headache is a migraine. Migraine headaches are usually characterized by severe pain on one or both sides of the head, disturbed vision, and/or an upset stomach. Men are less likely, compared to women, to have migraine headaches. If you are getting frequent headaches, it is important to not ignore them, because it is your body's way of letting you know something is wrong. Use it as a warning sign, and start to include some of these foods in your diet that I share below. I will share with you some foods that you can start eating or start eating more of to help get rid of your headaches fast. Including brown rice in your diet can help prevent headaches. Brown rice is rich in vitamin B-6. This vitamin is a water-soluble vitamin that lowers the body's stress level and alleviates pain. I started adding brown rice into my diet weekly, and I saw a huge difference in the amount of headaches I was getting. I still eat brown rice every week in order to prevent headaches now. Being deficient in vitamin A can lead to fatigue, insomnia, sinusitis, and colds which can then lead to migraines and headaches. This is why it's very important to get enough vitamin A in your diet. Most green vegetables are rich in vitamin A. Other foods that are vitamin A rich are red peppers, carrots, sweet potatoes, yellow squash, garlic, fish oil, peaches, cantaloup, and papaya. Having a deficiency in Vitamin B Complex can lead to anxiety disorders caused by stress. Some of these would be chronic fatigue, irritability, nervousness, blood sugar problems, and depression. This symptoms could trigger headaches. Vitamin B Complex includes B1, B2, B5, B6, and B12. Some foods rich in the B complex would be peas, asparagus, broccoli, spinach, oatmeal, fish, salmon, nuts, prunes, brown rice, whole grains and sea vegetables. If you are deficient in magnesium, it can lead to interference of transmission of muscle and nerve impulses. This can cause nervousness and irritability which may trigger headaches. Some magnesium rich foods that you can start to incorporate in your meals are apples, avocados, brown rice, garlic, salmon, almonds, and any leafy vegetables. Potassium deficiency can lead to nervousness, depression, constipation, and insomnia which may ignite headaches. A few potassium rich foods are bananas, avocados, apricots, raisins, yams, yogurt, and beans. Some nutrients/supplements that can help reduce headaches are: Magnesium, Riboflavin, Omega 3 fats and CoQ10. You can buy these supplements at your local health food store. You can also get these nutrients by eating certain foods. Some foods you can eat to get magnesium would be spinach, beans, and swish chard. To get riboflavin eat kale, asparagus, and mushrooms. To get Omega 3 fats eat omega-3 eggs or salmon. To get CoQ10 eat salmon. A way to control your headaches is to control your diet, and avoid foods that can trigger headaches. Everyone is unique, so your food sensitivity triggered headaches may be caused by a different food than another person. But there are common foods and substances that are known to trigger headaches. Some of these foods can be cheese, heavy red meat, fatty foods, sugar, caffeine, alcohol and preservatives and additives in packaged or fast foods. Alcohol can cause dehydration which can cause headaches. Alcohol also contains large amounts of tyramine which can trigger headaches. So if you would like to get rid of headaches fast, and you drink, try eliminating alcohol and see if it makes the headaches go away. Steer clear of foods containing additives such as MSG, HPP or HVP, or natural flavorings. Avoid aspartame which is an artificial sweetener that is found in many sodas and drinks. It might be labeled as Equal or NutraSweet. Some people develop headaches after drinking drinks that are caffeinated. If this is the case with you, avoid caffeine. Many people, including me, have an allergy to gluten. If you are one of these people, then eating foods such as breads, grains, cookies, etc. that contain gluten can trigger a headache. This was the case for me in the past. I found out that eating foods with gluten was triggering headaches for me. If you find that gluten is causes headaches for you, the good news is there are many wonderful gluten-free products that you can buy at the store. So you can still enjoy some of your favorite types of foods. For me, I love eating my gluten-free cookies, and not getting headaches after. I hope you learned from this article, and will start implementing what I shared in order to get rid of your headaches fast. Here's to a new you... headache and pain-free!